My childhood home was just off the banks of the Piscataquis River in central Penobscot County where I could often be found wading its shores honing my fly fishing skills. I have many fond memories of exploring this little known river. It was here that I hooked my first Atlantic salmon while fishing for trout. Visitors to Maine and locals as well, often bypass this river for the more famous rivers to the north and west. When paddling or fishing this river expect to have a lot of solitude. This is a place where you will see abundant wildlife from whitetail deer and moose to daily sightings of bald eagles, heron and a diversity of waterfowl. 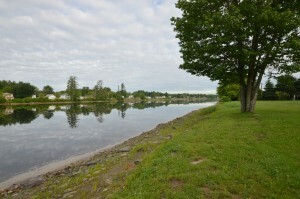 The Piscataquis River flows from small creeks and glacial ponds in its headwater just south of Greenville for approximately 65 miles to its confluence with the Penobscot River in Howland. Along the way small river and stream tributaries increase the Piscataquis River volume. The headwaters are in a semi-remote section of Piscataquis County. This is an area with a large moose population and wild eastern brook trout. The river flows through the woods until it emerges along Route 6/15 in the village of Abbot. From here the river flows through Abbot, Guilford and Dover-Foxcroft. Paddlers should pay attention along the way for rapids and portages. This section of river is sometimes stocked with brook trout. You will see fisherman above and below the covered bridge in Guilford, just move a half mile up or down stream to avoid any crowd. From Dover the river flows through Sebec, Atkinson and Milo adding the waters from the Sebec and Pleasant Rivers along the way. Milo to Howland is a beautifully peaceful canoe trip. Anglers will find this a good place to wet a line with abundant smallmouth bass and possible landlocked salmon and brook trout near the mouths of cold tributaries. Pick up a Delorme Maine Atlas and Gazetteer to for more details of the river and to help you find access points and boat landings. Please remember that the river flows through mostly private property, respect the landowners by packing everything out that you bring in.